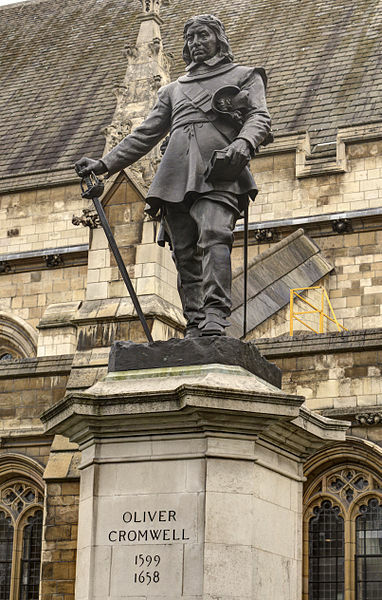 A statue honoring a bigot and mass murderer stands next to the House of Commons in Westminster in London, England. The fact that this criminal (who was never brought to justice or even officially charged with a crime) still has a place of high regard -- standing next to the very seat of government of Britain, placed there in 1899 during the Victorian Era -- shows us why this story of mindless hatred and atrocities must be told again and again. Never forget his crimes. Although his brutality and war crimes occurred 400 years ago, they had a profound and lasting impact on the Irish -- especially Irish Catholics whom he hated -- and affected the history of the Irish who eventually came to America. Beyond this, the story of his prejudice and injustice should serve as a warning to people everywhere and in all times of the terrible consequences for humanity of pseudo-religious fanaticism, blatant bigotry, and hate. The story begins during the English Civil War when the monarchy of England was at war with the Parliament of England. In this struggle which consisted of a series of wars with many players from 1642 to 1651, the Parliamentary side prevailed. Oliver Cromwell, who began as a fairly unknown member of Parliament ended up as virtual dictator -- called Lord Protector -- of Britain. His highly trained and well equipped fighting force, called the New Model Army, was successful in battle time and again. Cromwell began his political/military career in response to the tragic deaths of Protestants in Ireland at the hands of some misguided Irish Catholics during the Rebellion of 1641 where about 5,000 Protestants died either directly from war or even deliberate massacre or indirectly from homelessness or starvation. 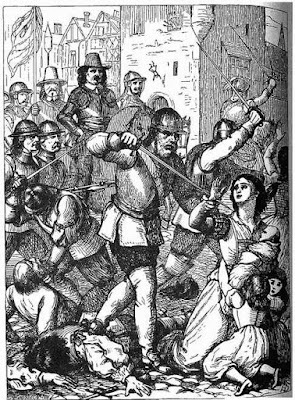 An infamous mass killing occurred in the north of Ireland at Portadown in Armagh in November of 1641. About 300 or fewer Protestant civilians were murdered, many forcibly drowned in the cold River Bann. One witness put the number at 100, however. Whatever the number, it was clearly a case of murder and an atrocity. 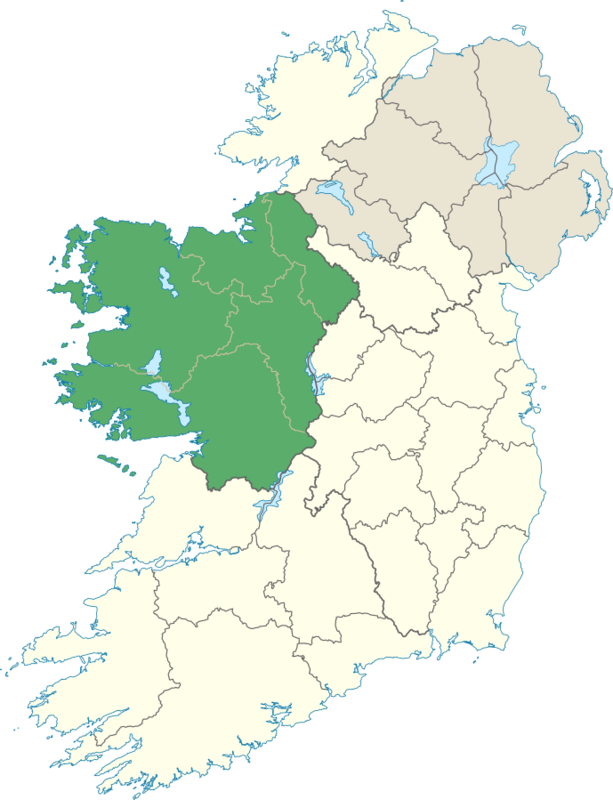 The Irish were rebelling against something called “The Plantation.” This was a land-grab process which King Henry VIII began, confiscating land owned by Irish Catholics and giving it to Protestants loyal to the British. The stealing of the Catholic lands continued with other English rulers including Queen Elizabeth and on and on to Oliver Cromwell. Land was given to English and later Scottish Protestants, and the Irish Catholics were driven away. Land in those days was not merely where one lived but also was the means to survival in an agrarian or agricultural society. Land was everything. The forces opposing Cromwell in Ireland in 1649 were a mixed bag. There were rebelling Irish Catholic gentry and Irish Catholic peasants, and elite English Loyalists, who were often Catholic, who supported the British monarchy, and Protestants who were loyal to the monarchy. As the old saying goes: An enemy of my enemy is my friend. Some of the Irish peasants would probably have even favored Cromwell’s views on protecting the rights of commoners; but his religious intolerance, racism, and brutality against the Irish would quickly change their minds. Cromwell demanded the surrender of Drogheda, but the enemy commander, a man named Sir Arthur Ashton, an English Catholic, refused. Cromwell then attacked the fortified town and conquered it believing himself to be an instrument of God. Ashton was killed along with thousands of other soldiers and civilians -- no quarter being given by Cromwell. No serious effort in distinction was made between soldier and civilian. The historian Seumas MacManus in his authoritative work called The Story of the Irish Race says that Cromwell in effect incited his troops to atrocious violence by placing with them Puritan preachers who openly hated Catholicism. The slaughter in Drogheda went on for three days. Crowell’s men killed some of the enemy who had laid down their arms and surrendered. 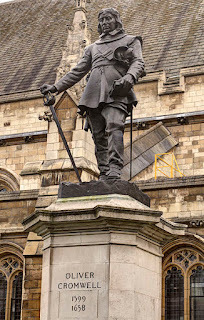 Cromwell’s men sacked Catholic churches and even burned out the steeple of St. Peter’s Church. Some prisoners were taken alive and were sent as slave labor to the Barbadoes, the British Caribbean colonies where sugar cane and other spices were grown. Some English Royalist officers were beheaded, and their heads were displayed on pikes. Reportedly, hundreds of civilians died. Many prisoners were sent as virtual slaves to British colonies in America. Cromwell wrote a letter to John Bradshaw, president of the Council of State (the new executive branch of the English government replacing the king), recorded as September 17, 1649, and said: “I do not think that thirty of the whole number escaped with their lives, those that did are in safe custody for Barbados.” Cromwell added, addressing Parliament, “The soldiers in the other tower [a defensive position in Drogheda] were all spared and shipped likewise for the Barbados.” Some prisoners were most likely sent as slave labor to the Caribbean island called Montserrat, where Irish descendants live to this day. 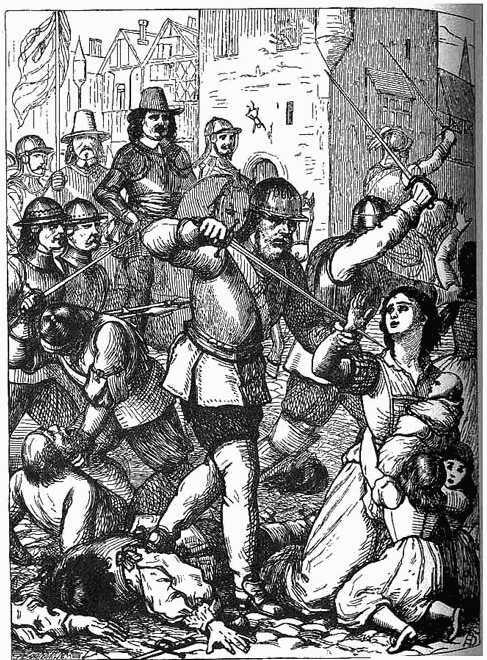 After Drogheda Cromwell went on to commit other atrocities in Wexford notably, and across Ireland. Adding to the prejudice against the Irish, wild stories were contrived that the Irish were not really human and were, in effect, animals with tails. MacManus notes in his book (see above at page 426 footnote 6) that Cromwell's soldiers stated upon capturing some of the Irish that they had tails several inches long. Of course, this was totally false and complete nonsense either the result of self-delusion or a deliberate lie to dehumanize the Irish. It is much easier to oppress and kill an enemy who is not really human. But the destruction did not stop there. 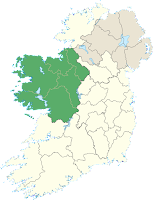 While some Irish soldiers, mainly professional soldiers, whom Cromwell could not defeat or capture were given a deal whereby they could leave Ireland and join the armies of certain foreign lands (these Irish were known as the “Wild Geese”), others were driven westward across the Shannon River to to be trapped on the least hospitable lands for agriculture in the province called Connaught (also spelled sometimes as Connacht). For Oliver Cromwell, the majority of the Irish could go “To Hell or Connaught.” And that expression has gone down in infamy in Irish history. Cromwell allowed many of the Irish peasants to remain east of the Shannon to provide labor for the new conquerors. He hoped that with their Catholic Gaelic leaders gone and the Catholic clergy killed or exiled, these simple people would eventually side with him and support his interests, even converting away from Catholicism. Cromwell, of course, was wrong. The Irish -- or most of them -- remained loyal to Ireland and Catholicism and simply hated Cromwell in return. The results of this Cromwellian invasion of Ireland were many. The chief physical result was the destruction of the old Gaelic, Irish Catholic rule in Ireland. After Cromwell the power in Ireland was English and Protestant. But … Cromwell failed to eliminate the Irish or their beliefs. And although Ireland would not gain independence until the 1920’s, almost three hundred years after Cromwell, the Curse of Cromwell -- the injustices, murders, and horrors he was responsible for -- instead of suppressing the Irish to nonexistence, backfired, and simply encouraged future Irish rebels to remember and fight harder. Much like in American history with the expression “Remember the Alamo,” the Curse of Cromwell only provided the impetus for more Irish rebellion and fighting.